Deshaun Watson Left. Clemson Evolved. Despite the pressure of filling Deshaun Watson’s shoes, Kelly Bryant has shined this season in a more run-oriented Clemson offense. Undefeated and ranked No. 2 in the AP poll, the defending champion Clemson Tigers are roughly a third of the way to reaching this season’s college football national title game. It would be their third straight trip. That’s hard to do, so much so that no college football team has made it to three in a row since the Florida State Seminoles did so from 1998 to 2000. On Saturday, Dabo Swinney’s 4-0 Tigers will travel to Virginia Tech for what may be their toughest — and most important — game until the playoff bracket is decided. 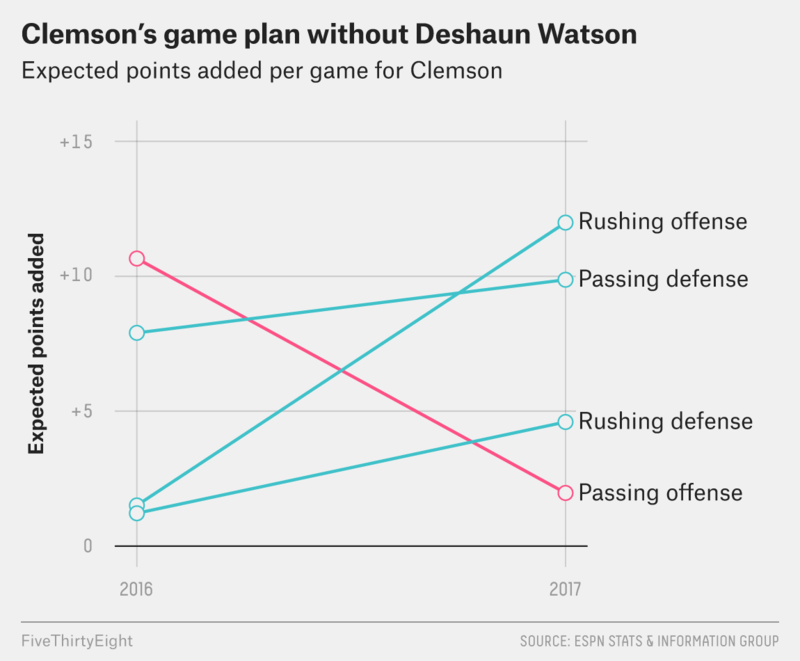 And they’re already coping with one major change in 2017 from the school’s last two dominating teams: Deshaun Watson now plays for the Houston Texans. But despite the departure of the superlative quarterback, Clemson has managed to survive by transforming the strength of its offense overnight. Heading into 2017, you couldn’t be blamed for thinking Watson’s production would be sorely missed. After all, he averaged 5,218 total yards in his last two seasons at Clemson — 4,351 yards passing and 867 yards running. And as we’ve previously noted, it’s difficult for teams to maintain offensive efficiency the season after losing their starting quarterback. But Clemson hasn’t missed a beat on offense. The Tigers are averaging 37.8 points per game through four games, compared with 39.2 for all of last season, and that includes a 14-6 dogfight with the Auburn Tigers in Week 2. So how has Clemson managed to play so well despite losing their talismanic quarterback? Given his reputation as a dual-threat QB, it might surprise you (it surprised us) that Watson led a pass-first offense last year, averaging almost double the yards through the air (334) as on the ground (170). According to expected points added, Clemson’s passing game generated 9.1 more points per contest than its rushing attack. Fast forward to 2017, and the offense has changed its focus, winning with a dominating run game. As a team, the Tigers are rushing for 105 yards more a game than last year, causing their offensive EPA to tilt in favor of the running game by 10 points per game. After serving as Watson’s understudy for his first two years, junior quarterback Kelly Bryant has been a driving force behind this change in playing style. Bryant is notching 25 yards more on the ground per game than Watson did last season. And he already has seven rushing touchdowns — Watson scored nine all of last season. It’s not been all about the offense, though. Defensive holdovers Austin Bryant and Dorian O’Daniel have helped Clemson’s D generate 6.1 more EPA per game in 2017 than it did last year. And unlike the offense, the Tigers’ defense has improved against both the pass and the run, cutting their points allowed per game almost in half to just 9.2. Swinney’s greatest coaching feat may come soon if Clemson continues winning. So few coaches in the game have shown the ability to continue winning amid a drastic change in playing style — Nick Saban and his recent rotating stable of quarterbacks at Alabama come to mind. And, not coincidentally, Saban — whose Alabama teams faced off against Clemson in the past two title games — will likely be waiting for him in the College Football Playoff.